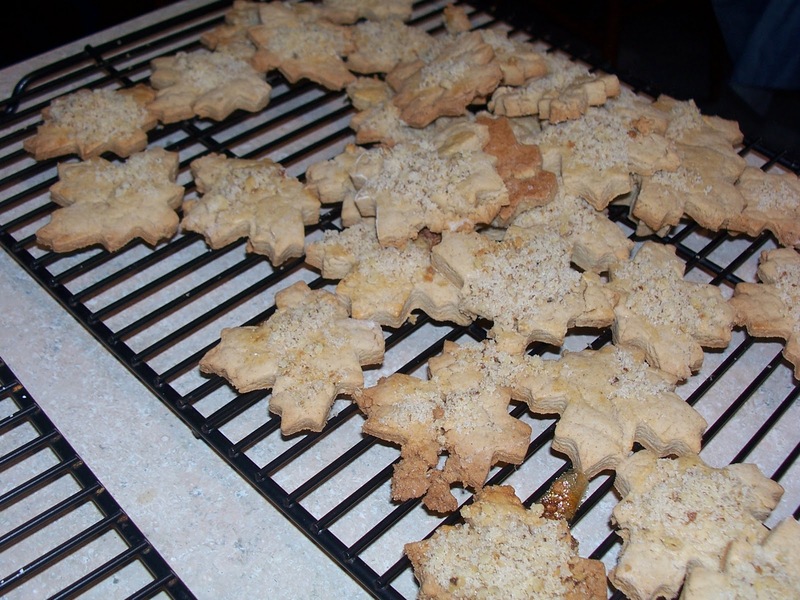 So today, we have started baking some maple cookies. I searched the internet for some good autumn recipes. 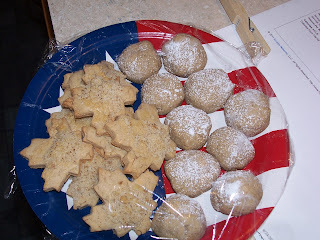 We have new neighbors and we thought we would bake something to bring over to meet them. We made the dough for Autumn Maple Cutout Cookies from My Recipes this morning. 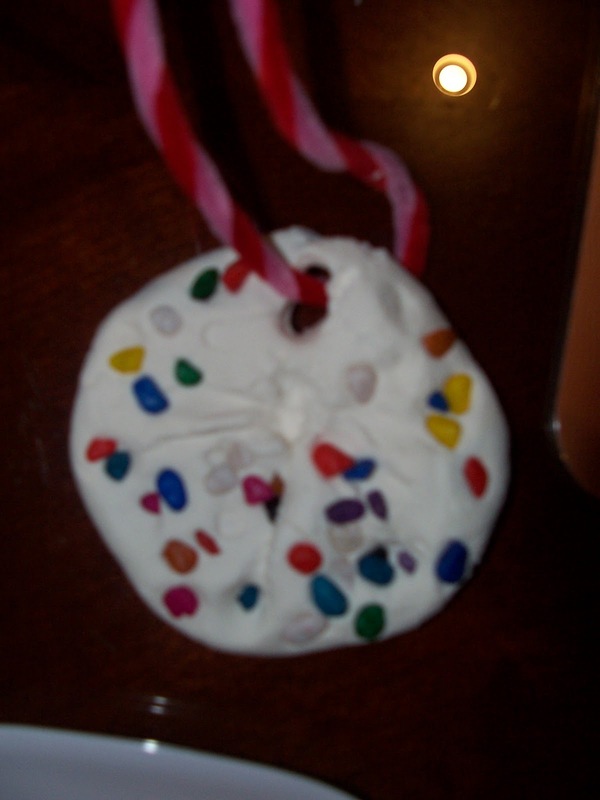 The dough ended up being very dry and hard to work with. I left in the refrigerator for several hours, so I do not know if this is why. They are tasty, but not my favorite. 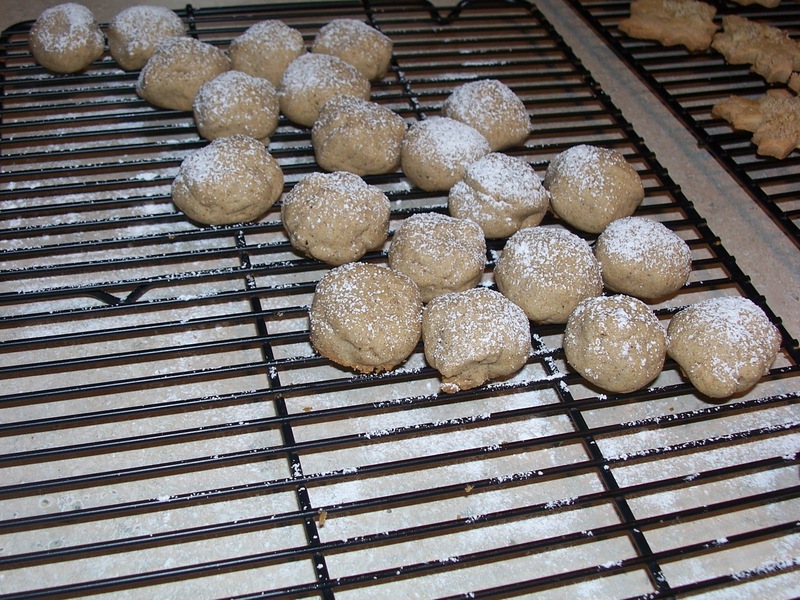 Next I made some chai spiced cookies (since this recipe uses the two egg yolks from the egg whites in the autumn maple cookies) while Hazel played with Steve (once he came home from work--he is still dealing with paperwork from Hurricane Irene!). We decided these definitely would be good to dunk into a cup of coffee or milk or something. Otherwise they are rather dry. 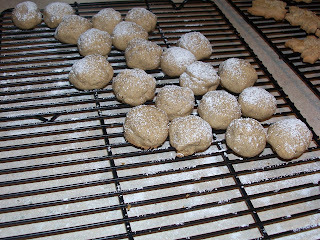 I decided not to roll them in the coating (powdered sugar and some spices) and just sprinkled them with some sugar on top. For dessert with dinner I made cinnamon apple tartlets (which I knew Steve will love). They are so easy and he loved them. 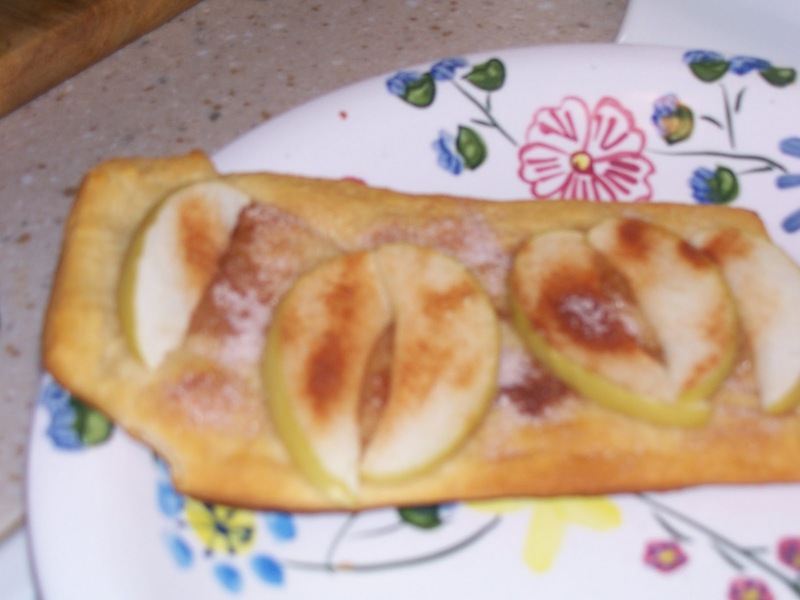 He loves apple pie, so anything similar is always a hit in our house and something that can be made in 15 minutes without much mess is wonderful! Sorry most of them were eaten before I got the camera out. They were definitely a hit. I'm hoping to make some spiced pear bread, and I also have some very ripe bananas and would love to do some pumpkin bread or pumpkin cookies this week as well. We will see what I get to as the week progresses though. If I get up early enough I will try to make the spiced pear bread or some banana muffins before going to church. I bought a small sugar pumpkin to cook and try to make something with it. It will be the first time I'm using a fresh pumpkin. We went out to run errands, but to get Hazel to leave when I wanted to I bribed her into going to Lakeshore Learning Store first. 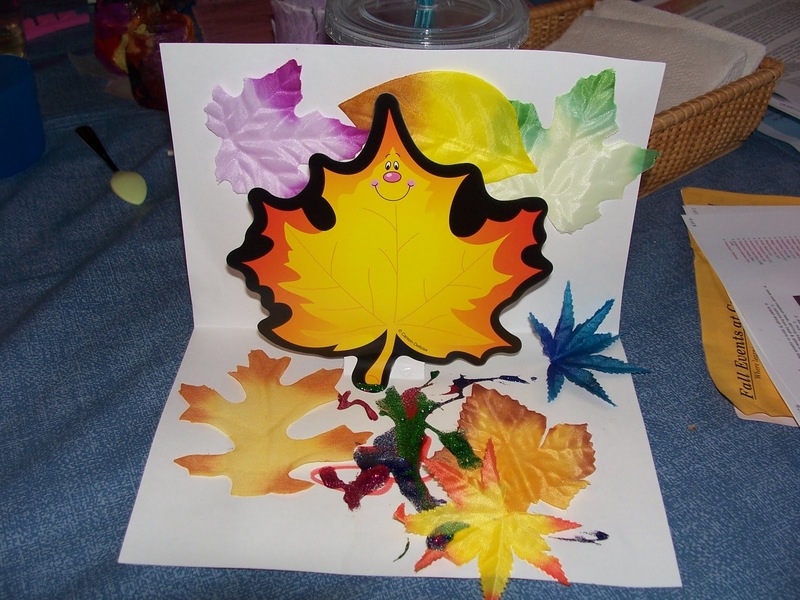 Do you know every Lakeshore Store has a free craft on Saturdays. 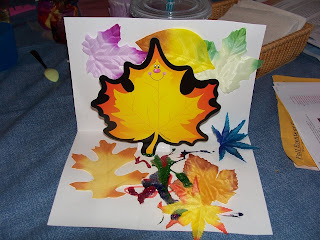 Last week we stopped in since we were out on a Saturday (something we usually try not to do) and made a Make Your Own Fossil and this week it was Pop-up Fall Cards. Hazel loved playing with the glitter glue today. It was the first time she was able to get it out on her own. Of course Hazel loves going there since they leave toys out for the kids to try. Needless to say I spend a fortune there between craft supplies and educational toys and bribing her to leave. Well after an hour there and about $45 later, we left and it was lunch time so we skipped the rest of our errands until after nap. Of course she is refusing to take her nap, so we will see what happens. I enforce at least a half hour of alone time when she refuses to nap, because I think it is important for everyone to have a bit of alone time each day. I can hear her playing in her room now. She's happy. I'm tired after a late night with her, but she doesn't seem to be. 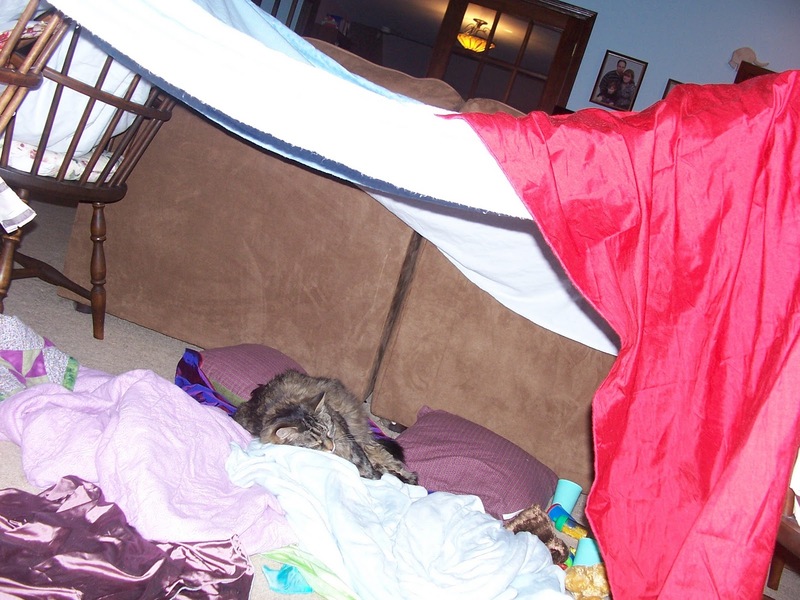 Then to end this post I will share with you the fort/house Hazel and I built today out of her clothes. She has flannels and silks and some large clothespins for such play. Apparently she is not the only one in our house that enjoys them. This morning I was often called in to remove Fluffy from it and this evening I took this picture (this is Pumpkin). Anyway, thought I would share the recipes I'm hoping to try and the free craft in case you have a Lakeshore Learning Store near you. Have a wonderful weekend! !